The Crystal Gallery Mall is in the process of rejuvenating, and as a part of that process it has secured a child care center to be located on the side of the mall that was previously used for office space. A conditional use permit is required for any child care centers in the C2 zone. The owner was also requesting a variance to place the outdoor play area closer to the property line than is usually allowed. This is due to the unique shape of the property. A small part of the fence will be located 7 feet from the public sidewalk. The only item we discussed was the fence on the play area. The owner presented a plan for a black chain link fence. We discussed whether this type of fence was adequate for both safety and atheistic reasons, but ultimately decided it was up to the property owner. The CUP was passed unanimously. The second item we took up was a pair of setback variances for a private property on Quail Ave. A couple recently purchased the home there and are looking to put an addition on the house, and are considering a future addition to the garage. 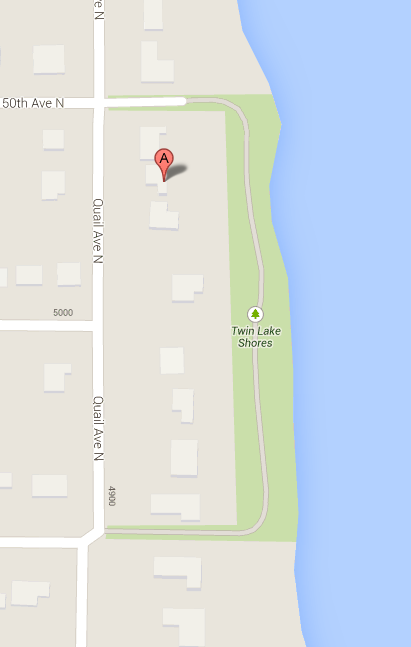 The house is in a very strange part of Crystal, over by Twin Lake, right by the Twin Lake Shores walking path. The land that is used for the walking path was originally supposed to be a road, so the houses face toward the lake / path. Quail Ave was supposed to be an alley, so the garages face Quail. The road was never built, and eventually Quail became the road, so there are a few houses that “face the wrong way” and have their garages in what could be considered their front yard. The City Planner suggested that we take up the variances for the house and garage separately, which we did. The variance for the house was non-controversial. There is a small bump-out on the house that is 3.5 feet from the property line, and the setback requirement is 5 feet. The homeowners are not actually touching that part of the house- the variance is required because the property is technically legally nonconforming (“grandfathered in”). They are allowed to keep things as-is indefinitely, but once they do any work they are supposed to either bring the property into compliance or get a variance. The variance for the house passed unanimously. The garage variance was the cause of much more conversation. The garages on this street are all located about 1 foot from the property line and the street, which was originally an alley. The City Planner was recommending that we deny the variance request for the garage, which would mean that if the homeowner would ever wish to expand the garage, they would instead be forced to demolish it and move the wall 3 feet back from the street, and 3 feet from the neighboring property. I visited the property before the meeting, and while I was there I noticed that this garage backs up to the garage next door. They are both the same distance from the street. There is a small gap between the two garages, as they both back up against the respective property lines. I argued that we should allow the variance, because the homeowner replacing the existing structure in the same place would not “alter the essential character of the locality,” which is the legal standard used to make these decisions. The homeowner addressed the commission and stated that he had discussed the project with his wife, and upon examining the structure they agree that the garage should be demolished and moved back 3 feet from the street. He requested that they be able to keep the north wall of the garage where it currently is. We voted unanimously to continue the matter until the next meeting, at which time the city staff will present us with new findings based on the modified request. At the end of the meeting we reviewed the letter that the city sent to the Met Council, challenging their ridiculous projections for 2040.